A Blueprint for success with I^3. The Ideal Intensity Indicator is optimized to discover extreme oversold and overbought conditions in real-time that are likely to quickly reverse and provide significant return on risk with minimal trade duration. Because I^3 is designed to alert users BEFORE the reversal occurs, traders have sufficient time to optimize entries, trade plans, and manage risk prior to executing the trade. Here we present two of our favorite trade blueprints to help you understand how using I^3 can improve your trading results. 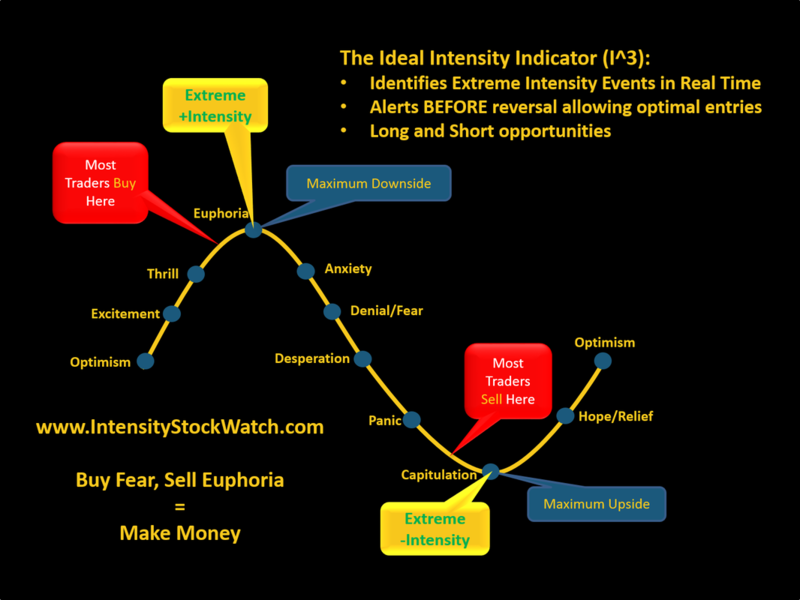 One way to easily interpret the Ideal Intensity Indicator is to consider it a FOMO (Fear of Missing Out) vs Fear gauge. Moments of extreme FOMO and euphoria push stocks to significantly overbought conditions. Similarly, moments of extreme panic and fear drive stocks to grossly oversold conditions. Both of these events are very likely to reverse providing traders prepared for them the opportunity to execute high probability trades with set risk and set profit targets while minimizing random and emotional trading. Building a trading strategy around these high Intensity events significantly improves bottom line performance. While there are many, many, many ways to profit from buying and selling stocks, options, and other financial products, there are just as many ways to lose. Consistently and reliably generating profits requires discipline, risk management (both emotional risk and $ risk), and a trade setup that provides a high probability edge. For many traders, the challenges of finding and executing a trade without random or emotional biases can be a daunting task. While the two strategies presented here are a complete trading system in and of themselves (augmented with proper risk management, position sizing, emotional management, etc), they are only a couple ways traders can use I^3 in their trading arsenal. I^3 can easily be combined with other technical indicators, chart patterns, and relevant factors such as news events or earning reports to suit individual traders style, risk tolerance, and time frame. Combining -I^3 events with the Ascending Triangle chart pattern provides traders a solid foundation to execute high probability set risk/set reward trades. While not 100%, these setups do provide substantially favorable odds of success. This setup is particularly suitable for new and intermediate traders because of it's simplicity, easy identification, as well as fixed trade execution and profit taking methods. Highly proficient traders will likely further optimize this scenario by "dip buying", anticipating the final setup, ultimate reversal, and maximizing returns through multiple profit targets. Similar to the High Intensity Bullish Trade setup, combining +I^3 events with the Descending Triangle chart pattern provides traders a solid foundation to execute high probability set risk/set reward trades. These setups also provide favorable odds for new and intermediate traders (single entry, single exit type traders). Highly proficient traders will likely further optimize this scenario by "shorting pops", anticipating the final chart pattern and ultimate reversal.